Thinking of picking up an air purifier? It certainly makes sense to want a safer indoor environment for you and your family. But if you’re like most first-time buyers, it’s far too easy to buy a cheap model from one of the big box stores or online. And that could be a big mistake. Just What Kind of Air You Breathing? Air-quality seems to be as bad or worse than it’s ever been – at least for a lot of people. That’s why each of us needs to take responsibility and improve our indoor environments as much as possible. 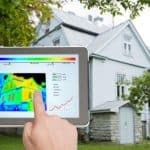 The truth is, healthy, breathable indoor air doesn’t come cheap. But when you think about it, what’s more important to you and your family’s health and wellness than being able to breathe easily fresher, cleaner air on a regular basis? When you come to this realization, you’ll want to look for a better more effective and durable air purification system – like the ones made by Blueair. The look is sleek and elegant and blend into any room’s decor. And the build quality is better than most. With a body made of metal, you know your Blueair is going to last for a number of years. if you’ve only used those cheap air filters before, you’ll be thrilled with the quality of your air when you use a Blueair purifier. they look sleek and the smaller models are relatively compact and easier to fit into any style of interior design. Each of these Blueair purifiers delivers quality, high-performance air purification through its “HepaSilent” filtration process. With large vents and a special filtration process and media – Blueair devices naturally run quieter, despite their efficiency at processing indoor air. All of these purifiers are Wi-Fi-enabled devices that you can control from your own smartphone. The HEPA filter removes 99.97% of the airborne allergens and pollutants like pollen, pet dander, dust, and mold. With each of these models, there’s also an optional activated carbon filter available that’s perfect for the removal of smoke, odors, and Volatile Organic Compounds in the air. 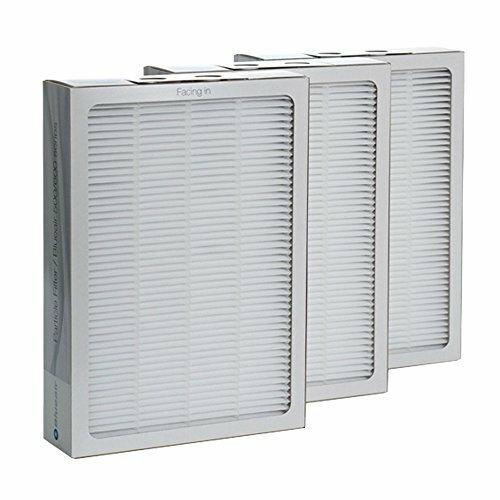 I recommend getting this additional filter and enjoying fresher, healthier air all year long. Any Blue air Classic air purifier combined with the Blueair Friend App on your smart phone allows you to turn your air purifier on or off and adjust its speed remotely. 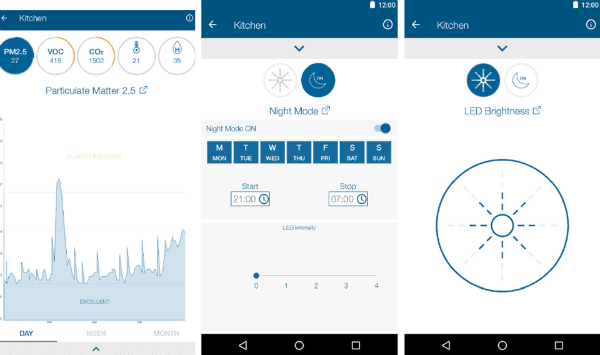 You can also schedule night mode and adjust the LED brightness. These are handy features to have. However, it does not automate your air purifier. in order to accomplish this, you will also need to purchase the Blueair Aware Indoor Air Quality Monitor. This handy monitor, in conjunction with your air purifier can be set to automatically turn on (or ramp up it’s power) when the air quality reaches a substandard level. While it’s not necessary to have a smart phone or tablet in order to benefit from a Blueair classic purifier, it does make your life a little bit easier. Most people already have smartphones and connecting yours to your purifier gives you added flexibility and functionality. The Blueair Classic air purifier is provided in several versions, including the 205, 405, 505, and 605 series. The series that’s right for you is based on the room size in which you plan to locate your purifier. 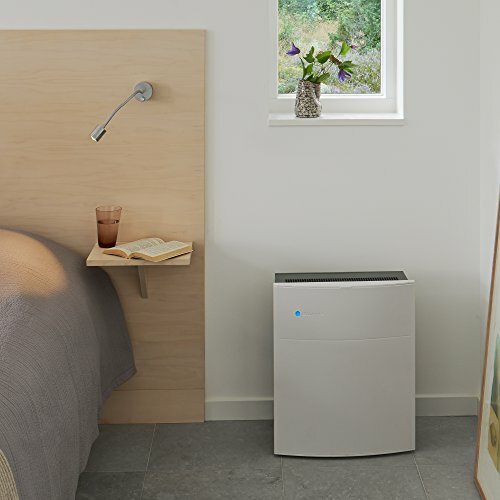 Air purifiers are designed to work one room at a time. But homes are divided up into a series of rooms. 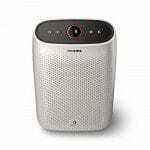 To effectively purify the air in any one room requires the presence of a purifier there. Open living and dining spaces are effectively one room. With the right size of machine, those larger areas can have cleaner air too. The 205 series is designed for smaller bedrooms and apartments up to about 280 square feet. The classic 400 series is best suited for larger bedrooms and small to medium living areas of up to about 480 square feet. 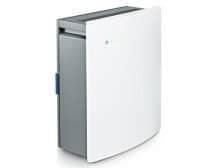 The Blueair Classic 505 series is meant for rooms up to about 580 square feet in size and the Classic 600 series is designed for larger rooms, open spaces and offices up to around 680 square feet. With three separate fan speeds a generally quiet operation and a compact size, the 205 model is perfect for a small office or child’s room. For larger rooms, simply choose the model that can meet your square footage needs. How Effective is the Blueair Classic Air Purifier? Blueair is a well-respected name in the air purification industry. It uses the best of electrostatic and mechanical filtration to capture 99.97% of airborne particles such as mold, dust, pollen, and other allergens and impurities from your indoor air. You get the best air purification when the air in any room is turned over five times per hour. At the recommended room capacity for each of the Classic series – this is exactly what the Blueair Classic air purifier achieves. Blueair units consistently score high ratings on review sites. 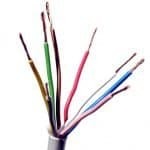 The key to getting the best results for yourself seems to be in not overextending the manufacturers specifications. These things are tested rigorously. You’ll find that it does an excellent job of cleaning the air in a room that is within that specific model’s capacity. The Classic features an attractive design with “smart” engineering. You’ll find that it filters dust, pet dander and mold spores from the air. The musty smell of mold is also neutralized as the air passes through the filter. In fact, it doesn’t matter what kind of pollutants are present in your home or office. With the right filtration, the Blueair will work quite well. Remember though, if you need to filter smoke and VOCs, you’ll need to purchase the secondary filter to do the job properly. Another plus is that these units are economical to operate. Chances are, you won’t notice much of an increase in your electric bill. 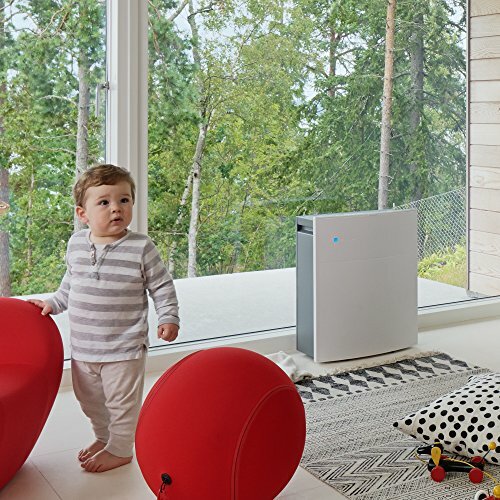 If you suffer from asthma or allergies, you’ll want to try a quality air purifier and Blueair certainly fits the bill. Even if you don’t suffer from these common ailments, you would only benefit from cleaner indoor air. 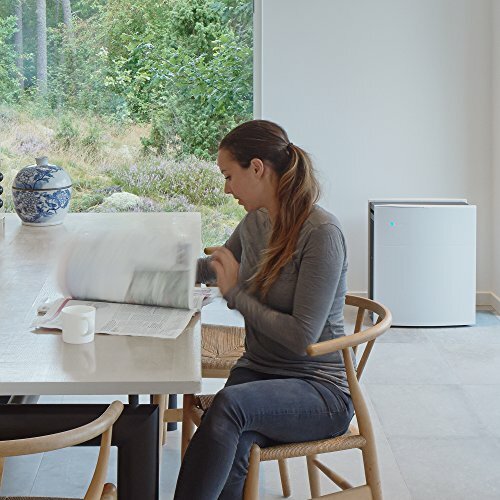 With an advanced process and filtration media that’s less dense than traditional HEPA filters, the Blueair Classic purifier can operate more efficiently than a true HEPA filter can. It’s this air processing efficiency that enables blue air machines to operate more quietly than competitors. However, don’t expect it to be completely silent. Sound levels are a funny thing. A noise level that doesn’t even register with one person can be annoying to the next. Just understand that these machines need to be of a certain size to effectively clean the air in a room. They also have electric motors and as far as I can tell – the silent motor hasn’t yet been developed. Blueair recommends that the filters on the Classic purifier be changed every six months. Replacement filters run $60 apiece. So it will cost you about another one hundred and twenty in filter costs annually. It all adds up. But it’s important to make your inside air as fresh and clean as possible. While the standard unregistered warranty covers you for one year, simply registering with Blueair extends that one year warranty to five years. It’s a simple process too – so don’t miss out on your full protection package. To qualify, you need to register at Blueair within 60 days of your purchase. However, you may find it slightly annoying that the Blueair air purifier requires regular filter changes to maintain the warranty. On one hand it seems costly. On the other hand, it’s a relatively small price to pay for healthier, cleaner, fresher air. What’s great about switching out the filter is that you get to see just how effective the Blueair purifier actually is. Inevitably, when you take out the old filter, you’ll notice that it’s dark and dirty. This is clear evidence that it’s doing its job and removing pollutants from the air you would otherwise breathe. It is also recommended that you also pick up the charcoal pre-filter for your device. This helps increase the life of the machine while keeping odors and smoke at bay. What you get with a well-made machine is one that can operate 24 hours a day for years without an issue. Just remember to clean those filters whenever possible and replace them as necessary. Blueair designs and manufacturers some of the better air purification units available today. With multiple models available to suit various spaces, chances are there’s a Blueair purifier that’s just right for your needs. One strong indication of a quality brand can be found in the overwhelmingly positive reviews found online. As with any quality purifier, the Blueair isn’t cheap. But it’s a quality device you won’t mind paying for.